Were those carvings made back in 1421, 39 years before the arrival of the Portuguese? And are they in Malayalam language ? In 1421, the year when the Great Wall was finished, China sent out a fleet of more than one hundred ships to discover the world. Reports say they crossed the Indian Ocean from Calicut to the African East Coast - what was not new for Arabo-Swahili, Indian and Chinese captains in the Middle Ages. They rounded the Cape of Good Hope and went North following the African West Coast. Then (as always when discoverers come to Cape Verde) a serious storm took them to the arquipelago, presumably to Santo Antão. And here - as in other places they visited - they left behind "carved stones" (crioulo: rocha scribida) in order to give proof for their presence to later generations of discoverors. So far the fascinating story told by submarine captain Gavin Menzies in his book 1421 The Year China Discovered the World. He diagnoses the writings on this rocha scribida as Malayalam, the language spoken to date in Kerala, southern India - and in its harbour city of Calicut, where the fleet has started from. Later Menzies follows the fleet to Greenland, the North Pole (he claims), the Americas, the Magellan streight before it crossed the pacific ocean and found back home to China. Some of the stories are astonishingly alike what was told for ages around the Atlantic - long before Columbus set sails in 1492. 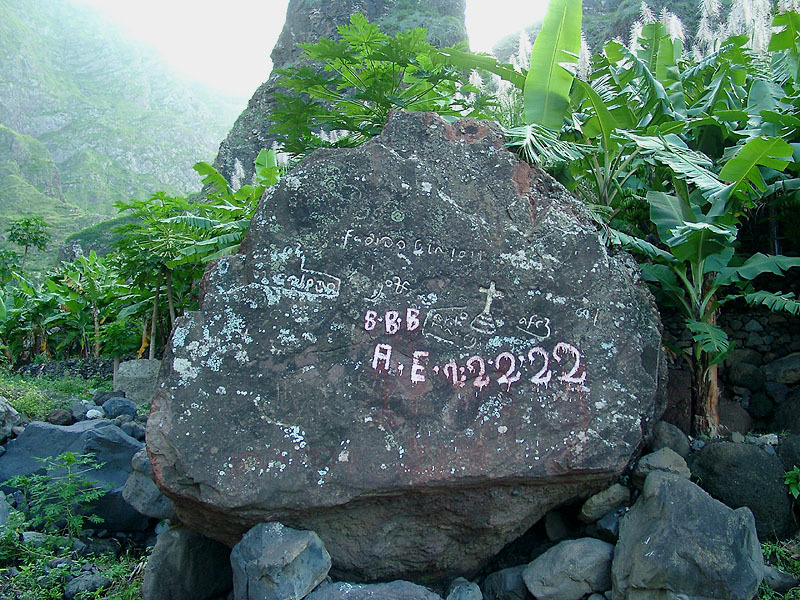 The name Pedra da Nossa Senhora stems from catholic interpretations of the writings as a first document of Portuguese sailors setting foot on Santo Antao Island. The central part with the cross documents the death of a portuguese sailor. Have a look at our map of Santo Antão and go to the round-about next to Pontinha de Janela. 10 min of walk over the mule-track river-up takes you to the place. If you go for historical evidence, most likely you will not belief in Menzie's story. Reknown historians argue that none of his findings are new and that his way to combine the facts in a thrilling story is highly speculative and can not stand scrutiny by scholars. e.g. : The carvings were identified as something like "Malayalam" by an employee of the Bank of India, not by any linguist or historian. Why so? India has excellent historians and linguists by the hundred! - isn't it wonderful food for thought, sweet and sour, full of phantasy, even if wrong? - if this is the way, submarine captains draw conclusions in their leasure time ... how dangerous are they at work?